See how RavenDB keeps performance high by structuring indexes and the architecture in an optimized way. In RavenDB 4.0, we have done a lot of work to make this scenario as fast as possible. In fact, this has been the focus of a lot of architectural optimizations. When running a simple index, we keep very few things in managed memory, and even those are relatively transient. Most of our data is in memory mapped files. That means, no high GC cost because we have very few objects getting pushed to Gen1/Gen2. Mostly, this is telling Lucene “open wide, please” and shoving as much data inside as we can. And this is funny, really funny. What you are seeing there is that about 50% of our runtime is going into those two functions. 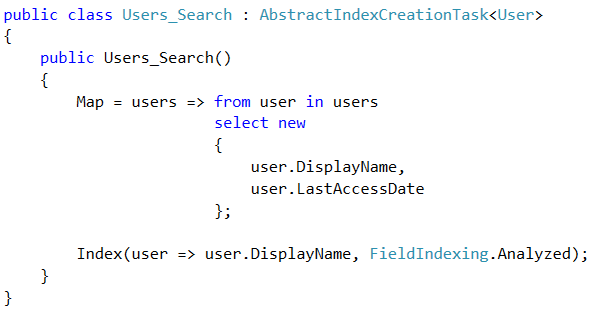 The problem is that the write.Delete() can be very expensive, especially in the common case of needing to index new documents. So instead of just calling for it all the time, we first check if we have previously indexed this document, and only then we’ll delete it. As it turns out, those hugely costly calls are still a very big perf improvement, but we’ll probably replace them with a bloom filter that can do the same job, but with a lot less cost. That said, notice that the runtime cost of those two functions together is 0.4 ms under profiler. So while I expect bloom filter to be much better, we’ll certainly need to double check that, and again, only the profiler can tell.